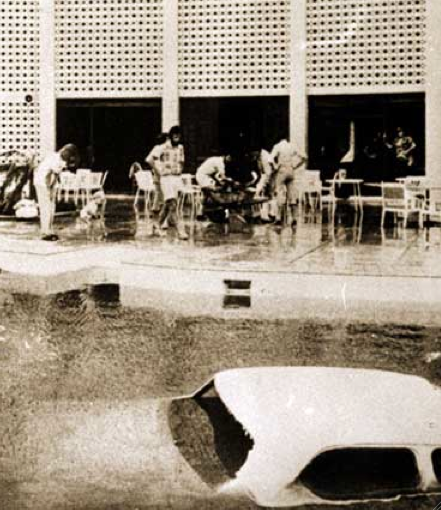 Cyclone Tracy devastated the city of Darwin on Christmas Day, 1974. The storm caused more wind-related fatalities than any other tropical cyclone in a developed nation since 1950 and nearly led to the abandonment of half the city. □ The city of Darwin, which sits alone atop Australia’s northern coastline, experienced a large surge of development in the years following World War II. Despite the existence of fairly standard building regulations, much of the city and its suburbs were constructed quickly in the 50’s and 60’s, causing many developers to turn a blind eye to the structural codes (Risk Assessment Model). As the city had not experienced a severe cyclone in many decades, the new suburban neighborhoods were built primarily with the tropical heat in mind. To take advantage of afternoon breezes, homes were elevated atop cement pillars and fitted with louvres for ventilation. By 1970, more than 40,000 people called the growing city home. On December 22nd, 1974, a swirling mass of rain entered within range of the Darwin radar. The storm, named Cyclone Tracy the previous evening, appeared small and meek as it spun ever so slowly to the southwest. 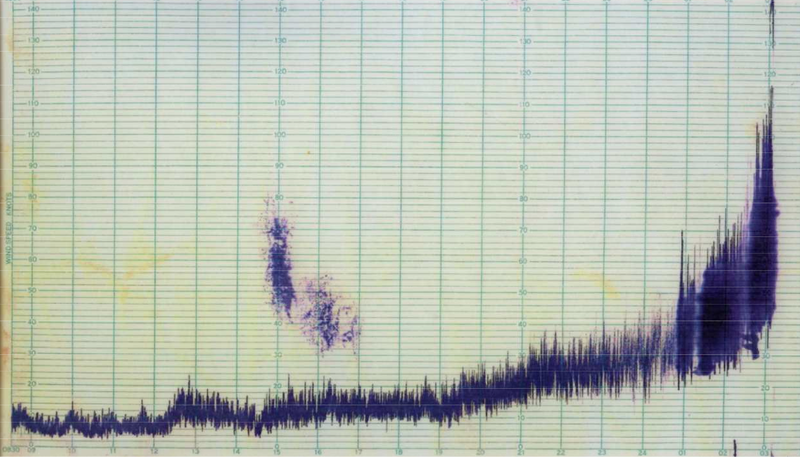 False alarms were commonplace in the tropics, and few paid much attention to radio warnings as the cyclone changed direction and slowly moved into the Beagle Gulf. Cyclone Tracy was an exceptionally small storm, being able to fit entirely within the 40 mile wedge between Bathurst Island and mainland Australia. Composite radar view of Cyclone Tracy on the evening of December 24th, with the city of Darwin highlighted in yellow. The eyewall surrounding the storm is unusually compact and symmetrical. Despite the center of the storm being a mere 15 miles from Darwin, the city was experiencing only moderate rain and breezy conditions. The most intense winds in the cyclone extended only a few miles beyond the edge of the eye. Cyclone alerts warned that “very destructive winds” of 75mph (120 km/h) with gusts to 94mph (150 km/h) were expected to hit the area late Christmas Eve. Many residents boarded up their windows while some chose to wait-and-see with the impending storm, which was forecast to be of only moderate intensity – the equivalent of a minimal Category 1 hurricane in the Atlantic. 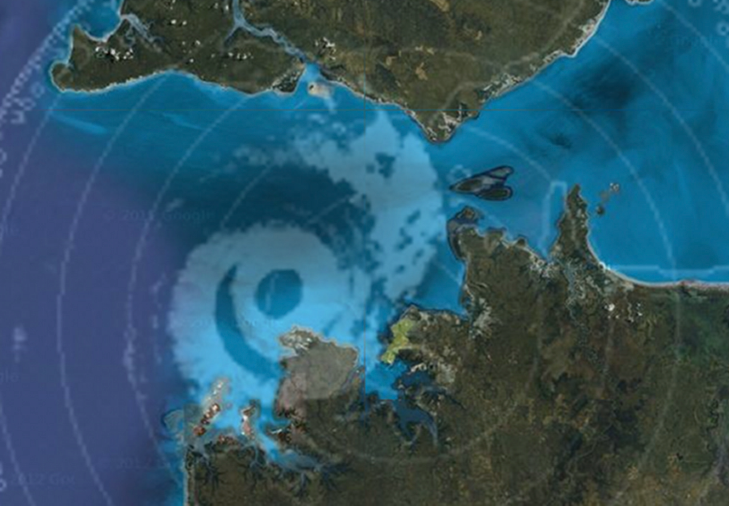 Only a dozen miles offshore, the eye of Cyclone Tracy contracted to less than seven miles in width. The storm would become the smallest tropical cyclone in history, with winds over 38mph (60 km/h) extending only 30 miles from the center of the storm, and hurricane force winds extending less than eight miles. * Unbeknownst to meteorologists at the time, the storm had significantly stronger winds than originally estimated, and was gaining intensity as darkness fell over Darwin the night of Christmas Eve. *Tropical Storm Marco in 2008 became the smallest tropical cyclone in history, with gale force winds extending only 10 miles from its center. The storm was significantly weaker, however. No storm of greater intensity has ever approached the tiny diameter of Cyclone Tracy..
Obliterated homes in Darwin’s northern suburbs. Winds picked up across Darwin shortly after 11pm as a few brave holiday partygoers left city pubs and headed home. By 12am Christmas morning, gusts of 50mph (80km/h) were being recorded at the Darwin Airport, and the winds were increasing with each passing minute. Around 1am, serious damage began to occur as hurricane force gusts reached the coastline. Convection surrounding Tracy’s pinpoint eye intensified throughout the night, causing the storm’s central pressure to drop to 950mb, or perhaps a bit lower. Later analysis concluded that Cyclone Tracy entered a period of “explosive deepening” in the hours prior to making landfall, causing the storm’s eye to contract to only 5 miles in width (Sydney Morning Herald, 1975). The cyclone’s extremely slow forward pace, under 5mph, meant that sections of Darwin were to experience hurricane force winds for more than three hours. At one point the winds were so loud that it didn’t seem they could get any stronger. I could hear the roof being torn off, and then something large smashed through the bedroom wall and took some of the house along with it. Before I could get a good grip on the counter, the whole structure came apart. My arm was badly crushed from a piece of timber. All I felt I could do was pray that I wouldn’t feel any pain, if it took me or not. Final view of Cyclone Tracy, around 5am, before the radar failed. 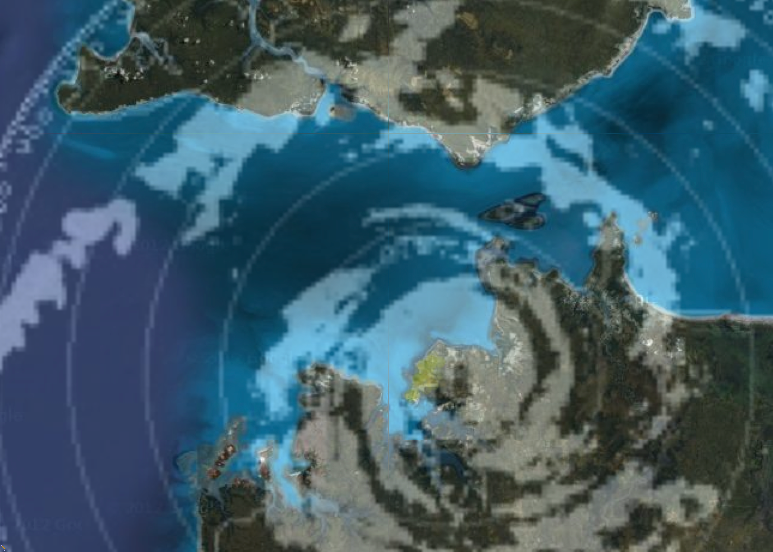 The storm’s eye contracted to only 5 miles in width in the hours before landfall (Mason and Haynes, 2010). As the leading edge of the back eyewall began impacting the airport, the radar failed, effectively ending all local analysis of the storm. The eye provided a brief 40 minute respite, confusing many into thinking the storm had passed. Survivors described the back eyewall of the storm as even more fierce than the front, accompanied by a roar that was heard several minutes before the winds recommenced. Due to the storm’s slow speed, the severe nature of the “second wind” was unusual. Some researchers later concluded that the winds in the western eyewall may have appeared more intense due to the multitude of debris left behind by the first half of the storm. Others researchers believe the storm continued to intensify slightly after landfall. One study also concluded that “decreased fetch roughness” in the back eyewall may have led to their increased intensity in the northern suburbs (Mason and Haynes). By daylight on Christmas Day, 71 people had been killed directly by the storm. Most of the 50 fatalities that occurred on land were in the northern suburbs, where the most extreme damage occurred. A detailed report on 46 of the fatalities concluded that 33 of the victims were crushed by collapsed buildings, and another 13 deaths were related to flying debris, mostly from slicing pieces of metal but also from “penetration” by flying timber. Injuries sustained from being blown out of elevated houses was also a contributing factor in some of the deaths (Mason and Haynes). In one instance, an injured man sought shelter in a neighbor’s home during the eye of the cyclone, only to be killed when the house was leveled in the second half of the storm. 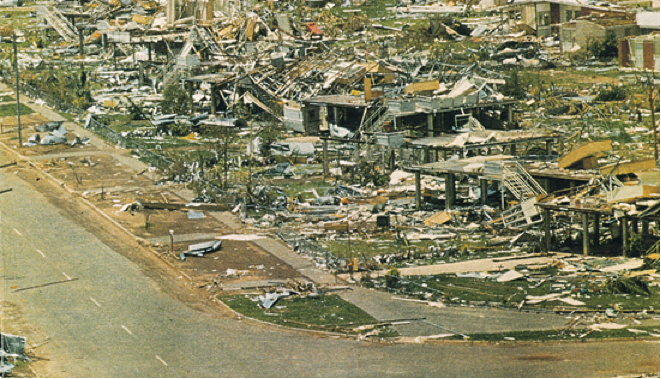 Cyclone Tracy caused more wind related fatalities than any other tropical cyclone to impact the United States or Australia since the turn of the 20th century. Hurricane Andrew, which struck a more populated area as a Category 5 hurricane in 1992, caused only 14 wind-related deaths. The high number of victims is likely the result of four factors – the extreme intensity of the winds, the duration of the slow-moving cyclone, the building construction in the area and the lack of evacuation preceding the storm (Griffith Review). A bus at the RAAF base was flipped multiple times and crushed by Cyclone Tracy (RAAF). Debate still exists over the exact strength of Tracy’s winds. Observations at the Darwin Airport indicated that sustained winds were rapidly intensifying when the instrument failed at 3:10am. According to the on-hand weather observers, the calm center reached the airport at 3:50am, so the 40 minutes preceding the eye, as well as the back eyewall of the cyclone, were not recorded. Therefore, it is probable that wind gusts significantly higher than 135mph affected the airport, which was south of the worst affected areas. Another notable variable is the pressure gradient of the cyclone. Observations in northern Darwin indicate that Tracy had a pressure gradient of 5.5mb per kilometer, or 8.8mb per mile (Courtney and Knaff, 2008). Such a steep gradient is comparable to some of the most intense Category 5 hurricanes in the Atlantic. While the central pressure of the storm was likely somewhere between 946 and 950mb, typical of a strong Category 3 hurricane in the Atlantic, the storm’s small size compressed the pressure difference into an unusually small area. At left, an apartment building that lost its upper floor. At right, a devastated home in Rapid Creek. The official report following the cyclone estimated peak gusts reached 150mph, or 240 km/h (Bureau of Meteorology Report). A more recent study suggests that maximum gusts were more likely around 162mph, or 260 km/h (Mason and Haynes). Some unofficial estimates place the highest gusts at 185mph (300 km/h) (Sydney Morning Herald, 1975). Considering the severity of the damage, including dozens of flipped vehicles and the deformation of thick steel beams, it is probable that many locations experienced gusts greater than 160mph. A number of meteorologists have suggested that vortices imbedded in the storm’s eyewall (later identified as “miniswirls” following Hurricane Andrew in 1992) may have been responsible for some of the more extreme damage. Evidence pointing to the existence of violent, small-scale wind features included a refrigerator that was found imbedded in the side of a water tower 50ft above the ground (Sydney Morning Herald, 1975). Pilots in the area also sighted tornadic vortices within the storm. Cyclone Tracy officially remains a Category 4 on the Australian Cyclone Scale, with sustained winds between 100mph and 123mph. The damage caused by the storm, however, suggests that the cyclone was significantly more intense. 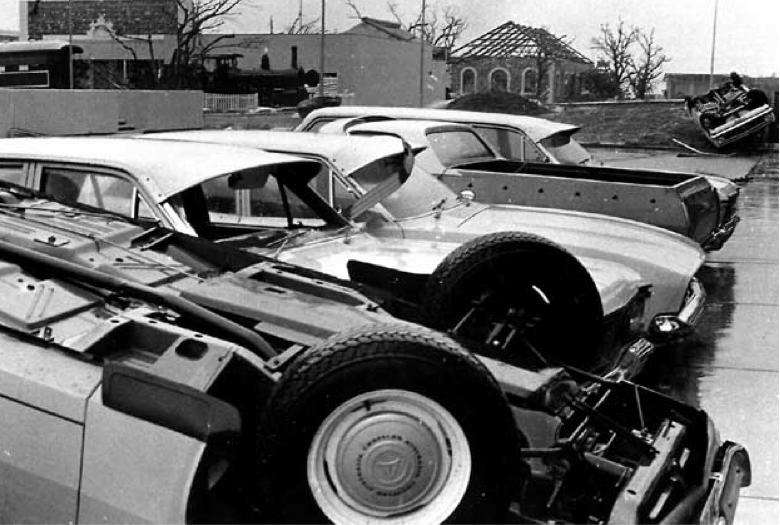 Vehicles flipped by Cyclone Tracy. The car at distance appears to have been tossed from a parking stall, perhaps as far as 20ft. There does not appear to be any nearby wall which could have provided upward lift, as is commonly the case when cars are moved by hurricanes. A recent study that placed vehicles in wind tunnels concluded that winds of 150 to 180mph were required to overturn minivans at less “sensitive” angles (Lyons, 2009). A car was blown into the pool of the Darwin Travelodge in downtown. 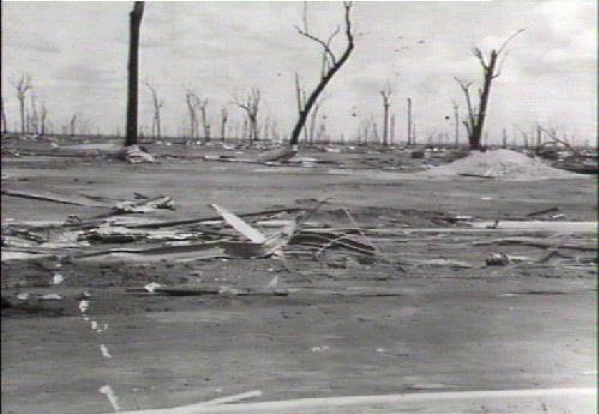 Extreme damage from Cyclone Tracy. At far right, a large steel electricity pole that was twisted and snapped by the storm’s violent winds. 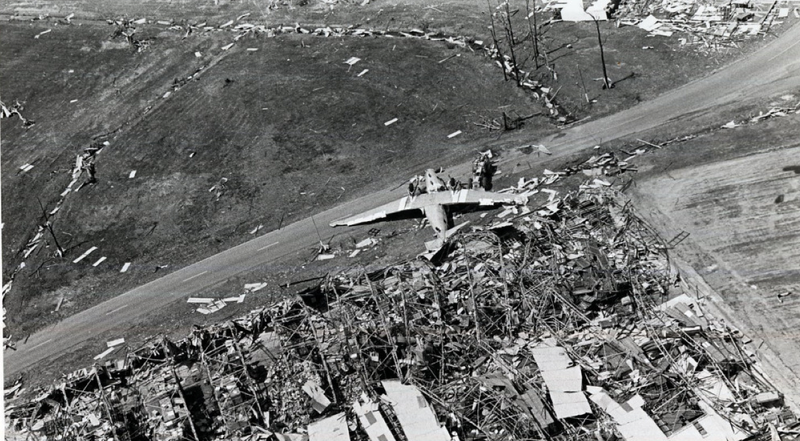 Cyclone Tracy remains the most damaging weather event in Australian history, and one of the most violent windstorms ever documented. Very informative article! Thank you for putting all this information together. 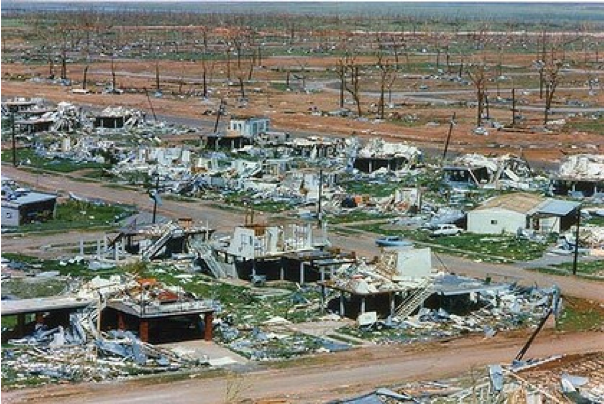 The damage caused by Cyclone Tracy was incredible. It is strange the official intensity is so low. The refrigerator stuck in the water tower really got my attention. That’s my Darwin Town. I was 9 at the time and I have a little private flashback every Xmas. This freak of nature (Tracy) shaped my life and has given me the strength to face anything. About 10pm or 11pm we lost our lights, so we got some lanterns and lit one up and saved the other for later, we rang the electricity board to tell them sparks were flying from the lines, we had a transistor radio on to hear what was going on, we were informed that the cyclone would hit at 10am Christmas morning. About midnight or a bit later we lost contact with the radio, we bedded the kids, Kenneth and Peter down for the night. About 2am the house started shaking about, we woke up the kids and gave them their christmas presents. Peter had been waiting for a bike for years, he was 7, he got up and looked at the bike and looked back at us and he just couldn’t speak, I said do you want to ride it, but he was too scared to go down the hallway, so I took him down and he rode it from the end of the hallway to the bedroom. He and his brother Ken opened all their presents. By this time the house was rocking violently, so we told the kids to lie down, Peter fell asleep. I went to the lounge room to phone the people up the road as i could hear terrible crashing noises, the phone rang but I could see the loungeroom wall starting to move so I dropped the phone and ran to the hallway, just as I got there, the lounge room wall blew across the house taking everything with it. I tried to open the hallway door but the winds were too strong so I joined my wife and kids in the bedroom, we told the kids to get under the bed and Peter who was very scared rolled straight under, but Ken didn’t want to leave my wife Sandra and I. Just then the wall caved in and a beam from the roof capsised onto the bed, Sandra my wife called out to Peter, but there was no answer, I went back to the bed but could not see him, then everything started cacing in, My wife and ken my son and I stood in the doorway of the bedroom and everything collapsed, we went down in the doorway which collapsed on our sons bike and bookcase, whic stopped us from being crushed, we tried to make it to the bathroom, but before we could make it the bathroom fell over the side. We could not get out of the house because the bathroom fell across the back steps, so we decided to stay where we were, it was at this time I found that Sandra’s legs were pinned under the doorway, I grabbed my son and pushed him between my wife and myself and I attempted to try and lie across them, we all held each others heads down so we would not get hit by anythintg, I then noticed that the lamp was still burning under the rubble that was once our bedroom. I pulled the door, which was still attatched to the doorway across us but it soon blew away, In the lightning flashes we could see that all the other houses were gone. I had a torch which I kept flashing into the air, but I knew no one would come, but it helped our morale a bit. About 3.30am the cot went over the side and the mattress blew on top of us and we could only hold it there a few minutes. We sat huddled like this for hours, my wife got hit in the corner of her eye with something, next moment I was hit in thye back and I began to see stars, I was blacking out when my wife sang out my name which brought me to. The Wind was so strong that we had to hold on with all our might, we knew we would never get out of it alive and at one stage thought about letting go, but our will to survive was stronger. Then out of the blue my son Ken sang out “God please help us” and we then prayed as a family, we prayed for what seemed like hours, then the lightning flashed and we could see the front stairs was still there, I told Sandra I would take Kenneth down first and come back for her as her legs were still stuck under the doorway, but she did not want us to separate, so I stood up and lifted the doorway with all my strength I had left and she was able to get her legs out. I then got her to lay on her stummock and I held onto the backs of their clothes and we edged our way to the stairs. When we got there, we grabbed hold of the rails and sat on the steps and went down one step at a time until we reached the bottom. We were amazed to see our car was still there, it had been peppered with gravel and dinted down the side and 2 broken windows one side was completely stripped of all paint, only shiny metal showing. We sat in the car and had a look around, what we saw deeply shocked us further than anyone could imagine for miles there was only stumps and floor boards and we thought that we were the only ones that survived, but gradually cars came and a police officer turned up and searched for Peter, it appeared that the water tank on top of the house had come down onto our bed. We allways were told to get under the bed in times like this but that was very bad information. It is an experience that will never ever go away, even today 40 years after I still cant come to terms with. Sandra and Ken was taken to the Casurina School before being air lifted out of Darwin, she was airlifted to Sydney Maternity Hospital where she gave birth to our daughter Meagan a few days later, on a light note if thats at all possible, the only underpants she had to wear was a pair of mine that had something written on the front, cant remember what it was but the hospital staff saw this and it soon got around the hospital and out of the blue a suitcase appeared with hunfreds of undies sent in my staff and patients. I was taken to Darwin Hospital where they stitched my back wound, but they had run out of stuff to do it do they just tacked it, I managed to get back to my car and amazingly it started, somewhere along the track I wound up driving General Stretton who had come to Darwin from Hospital to the AMP building which was the headquaters set up for the recovery operation. I stayed there most of the day when it was discovered how badly I was injured so I was flown to the Mater hospital in Brisbane, then to the HMAS Kutterbul and Sydney where they finnished closing my wounds and my ears were cleaned of glass fragments that filled them, my legs were peppered with gravel that had imbedded under my skin, I didn’t realise that I had all these injuries, I found out later that a metal louvre had hit me in the back and then hit my backbone and continued across the other side of my back. Sandra had her baby and everything there seemed to go ok and sometime later we were re-united with our son Ken. Thanks for sharing your experiences Ken. The reality of what happened and what we had to cope with is better reflected in your recollections than the “factual” narrative above. We WERE prepared and had done everything we were advised to do and were not in the least taking the strength of the cyclone or the danger in a light hearted way. We had seen the weather report on the evening news and had some idea of what could happen. Our night of hell on earth will always be with us, and our deliverance certainly not taken for granted. Our house exploded and the corner of our front door was driven through the floor. That, and falling timber formed a temporary protection around us, injuring my husband as he crouched over us to protect us. We are thankful for super-human strength in such a chaotic and dangerous night. The radar at Lee Point didn’t go down, it actually went flying off and ended up I don’t know where!!! No wonder it stopped reading! Christmas Eve has never been the same for us since! My intention was not to be dismissive – my statements on people being surprised by the intensity of the storm were taken from the sources I have read and the survivor I interviewed. I’d be happy to include more personal accounts of the storm and the measures taken to prepare for it. The warnings issued by the Tropical Cyclone Warning center (available in the link below) warned of “very destructive winds of 120km/h” as the cyclone came ashore. In reality, the winds were likely more than double that at 250km/h+. In that regard, I imagine the strength of the storm was a surprise even to the meteorological bureau. Hi. Yes I agree with Anne, Im tired of this meme that perpetuates even 40 years later that we were all blase and didnt bother preparing for a cyclone and we all lived in shoddy houses that the Little Pigs wouldnt have lived in. I dont think this has ever come from any survivor, its just a media story that is continually retold as fact. Forty years of it is enough! Despite not being advised about the true intensity of what was approaching, my Mum and Dad left a Christmas party early that afternoon to take all of us kids home to safety and prepared as best they could. No amount of preparation, however, could prepare people to have their houses disintegrate around them and be exposed to winds of 300km/hr and above. No building could withstand those sorts of winds, and a lot of the newer houses in the areas that fared worst were engineered to the latest cyclone building codes devised after Cyclone Althea hit Townsville 4 years prior. As for the windspeeds, 217km/hr, or even 260km/hr will not cause that sort of damage, as Cyclones Larry and Yasi demonstrated. My father told me that not only was every tree stripped of leaves and branches and brought down, but that every blade of grass had been stripped from the ground! My mother recalls that while waiting for evacuation at the airport the crowd was addressed by General Allan Stretton (co-ordinator of disaster recovery) that they had recorded winds over 300km/hr. He didnt make this figure up, it was recorded and its fact. That the government chose to hide those figures from the public has more to do with international politics than anything else; develop the north at all costs to protect our coastline from invasion. It was 1974, not long after Indonesia invaded our near neighbour East Timor. My article above contains the highest wind estimates available on the storm, along with my own belief that even the highest available estimates are an understatement. I tried my best to cast light on the true power of the storm. Scientific papers on the cyclone are my basis for including the impact of the construction standards. Survivor testaments are important information, as are peer-reviewed articles. Note the anemometer graph and its malfunction. It malfunctioned because it blew off the roof of the building at the airport, followed by the roof and everything else in the building. I believe it was retrieved in Alice Springs as someone had found it and took it with them when they left Darwin. I worked at the Met Office at the time and lost everything, family evacuated and I drove south to Alice and flew out from there. Had to go back because I could get a permit to return to work, many others were unable to get back and eventually settled elsewhere in Australia.